I was on the treadmill at the gym last night when I just happened to catch a scene from Muhammad Ali’s 70th birthday celebration on one of the plasma screens. 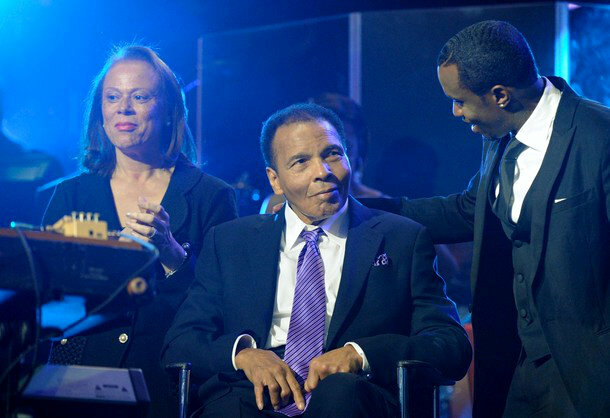 It was a star-studded event with everyone from Sean “P-Diddy” Combs, to Evander Holyfield in attendance. Everyone seemed to be having a great time. Everyone was jovial and lively everyone except for the birthday boy himself who was confined to a wheelchair due to pugilistic Parkinson’s. A lot of people who claim to be boxing historians will swear that Ali is the greatest boxer of all time and I’m not here to dispute that. What I do have a problem with is people who have never set foot in a boxing ring holding Ali up on a pedestal as the type of fighter that young fighters should try to emulate. Let’s face it Ali with all of his speed, charisma, power, and originality took way too much punishment in his career. It’s never cool for a heavyweight champion to invite 200-pound men to hit him at full strength until they themselves get tired. Muhammad Ali is a very intelligent man but that is a very poor strategy, which is evidenced by his inability to talk right now or walk on his own. I know people loved Ali for what he did outside of the ring as much as what he accomplished within the ropes but it’s not OK for us to say that someone like Floyd Mayweather will never be as good as Ali because Floyd has a defensive style. It’s not ok for fight fans to criticize Andre Ward and Chad Dawson for their unwillingness to have their brains beat in to please a crowd that doesn’t even regard them as human beings. As I looked at Muhammad Ali shaking in his wheelchair I saw a champion who gave all that he had to the sport that he loves so dearly. But I also saw a man who should serve as an example of what young fighters should avoid at all costs. Boxers need to keep their hands up in the ring, develop a solid defense, and once you retire then you need to stay retired. Remember that even when the crowd chants your name they do not love you, all they really want is blood. When all the cake has been eaten, the stage has been cleared, and people take off their fancy tuxedos and elegant nightgowns to go back to everyday life the champ will still be in a wheelchair. Above everything else, I think that’s very sad.